SKISA Karate Organisation together with its partners Gift of the Givers Foundation conducted a free development workshop for the pupils of Dawnridge Primary School as part of its Social Responsibility program. 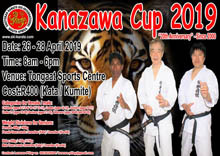 The workshop was attended by over 100 of the School youth who were introduced to the basics of Shotokan Karate by 2 Time World Champion from Japan Manabu Murakami. 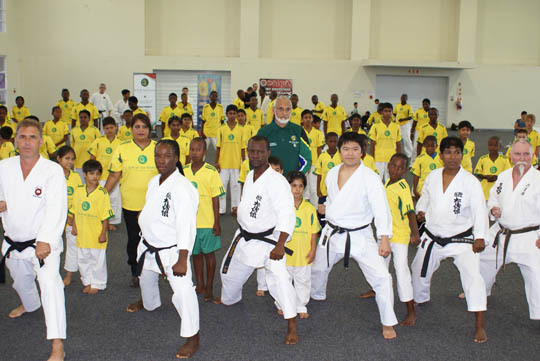 The Japanese maestro assisted by Vice President of Karate South Africa (KSA) Kyoshi Sonny Pillay also did a self defence demonstration that inspired the children to take up the sport at the SKISA club in Dawnridge. School Principal, Mr Pillay paid glowing tribute to Gift of the Givers Foundation and SKISA for their generosity and selfless service geared towards upliftment of the youth amongst the down-trodden. 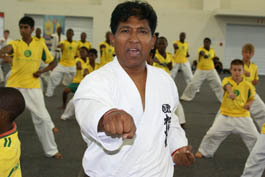 SA Karate Legend Kyoshi Sonny Pillay said we will continue to take karate to the township children, because karate is not an elite sport and must be practised in every part of our country. SKISA and GOG are also extremely grateful to local Sports administrators such as Pravesh Maharaj (CEO Crossmoor Sporting club) who will never fail to successfully arrange these free workshops. “Kyoshi Sonny Pillay and Dr Sooliman’s work amongst the township children particularly amongst the poorest of the poor is unparalled” said the MF Leader. 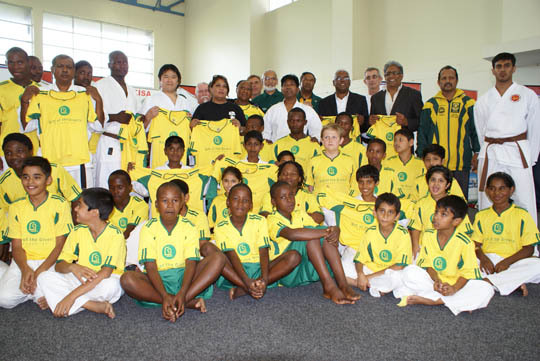 In response to the article in your newspaper this morning, I would like to highlight and make the public aware of the tremendous community initiatives that have been undertaken by karate legend Kyoshi Sonny Pillay and SKISA. 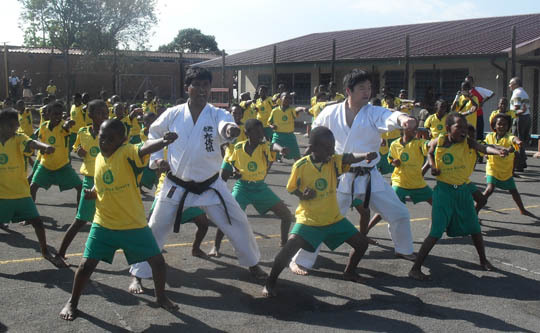 On 3rd and 4th May 2011, approximately 400 township children from informal settlements around Chatsworth, Phoenix and Inanda were fed, clothed and given a free karate workshop by Kyoshi Pillay and SKISA in collaboration with its partner The Gift of The Givers. 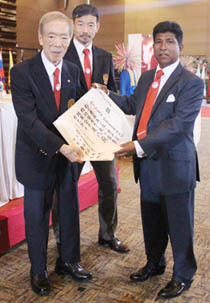 This partnership, on its own, bears testimony to the high regard in which Kyoshi Sonny Pillay and SKISA is held. Just recently on 8th August, SKISA held a global focus program with Umthombo Street Childrens Home with approximately 200 children in attendance. These children were treated to a sumptuous lunch, and were handed T-shirts. This was in partnership with DUT and AOL. 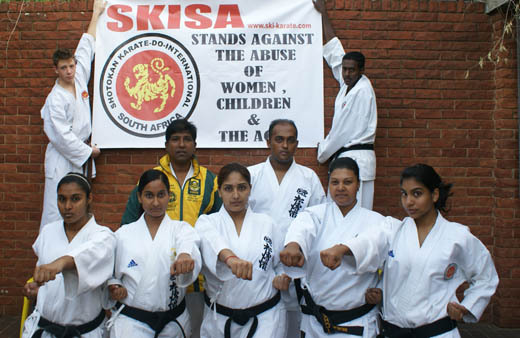 An ongoing project is the SKISA Against the Abuse of Women, where partnerships with various organisations make the community aware of this major national problem of woman abuse. 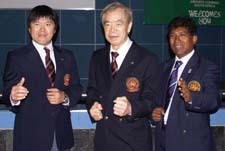 Kyoshi Sonny Pillay , has personally taken children from Ntuzuma Township and has produced 4 Protea Caps from the Ntuzuma and put them on the world stage in Japan. Greece, India and Serbia. This is apart from the numerous other Protea Caps that SKISA has produced, in excess of 40. 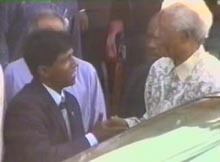 The accomplishments of Kyoshi Sonny Pillay and SKISA, and in particular their fight against apartheid, is far too numerous to mention in this forum. One has to just take a look at the present Protea Team, and we can see that whatever Kyoshi Sonny Pillay fought for over the past four decades, had made it possible for children of colour to proudly represent South Africa. 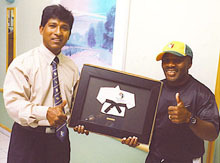 We salute Kyoshi Sonny Pillay and SKISA, the true legends of Karate in South Africa. May you continue to grow from strength to strength. The underprivileged children will always have a champion in you. SKISA has just launched its trust at the recent Sports Award Function referred to in your article, that has at the helm of its goals, the establishment of a high performance centre of sporting excellence in the Kingdom of the Zulu. 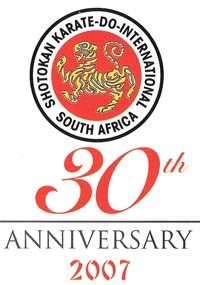 Shotokan Karate International-Do of South Africa (SKISA) initiated a “STOP WOMEN, CHILDREN & AGED ABUSE” campaign in 2007. 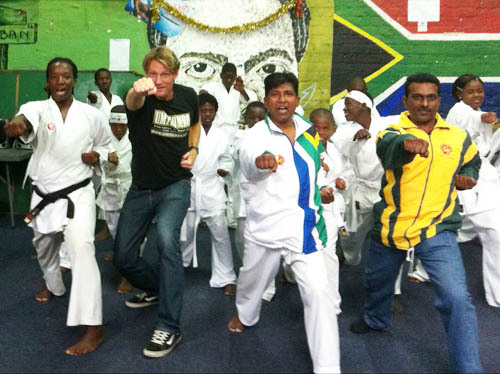 The ultimate goal of the project is to establish a martial arts academy where abused women, children and the elderly can find help and be offered a shelter for the vulnerable as part of rehabilitation. This will also include counselling, legal and moral support. 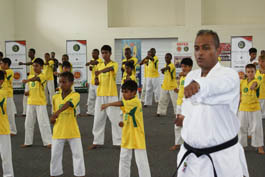 In a bid to address the moral regress among the youth, SKISA, a world recognised body of karate experts, intends to take their skills to students in the classrooms, shopping malls where teenagers frequent, and at various other places. And further to that SKISA is extending an olive branch to government, business and community organisations to join forces to fight crime, together, and teach youngsters, women and vulnerable groups, about self defence. Instead of preaching that crime is rampant, SKISA has requested that various organisation financially contribute and support this programme which will aid defenceless victims. Partnerships are fundamental in any successful democracy. Whatever we need to achieve be it economic or social we need to do it together in a collective approach. Only together can we achieve success. As a province, KwaZulu-Natal has come along way in creating peace and as an organisation which espouses the moral regeneration of our society; we say that the only way to make self defence fashionable is to take it to the youth where they are as the youth of South Africa can make a difference. SKISA believes in seeking peace firstly within ourselves and families we can reach out in peace to our neighbours and communities seeking solutions to social problems that ultimately fight crime. At present there is a ground swell of people wanting to rise up and do something about crime but first they need to arm themselves with self defence skills. 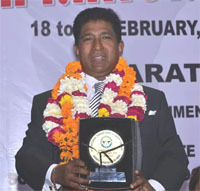 Most projects that have started in the Province with the same focus and intention have been still born. The fact that SKISA is reaching out to the youth first may have a better chance of survival. The aim of our initiative is to strive for peace and safety instead of just merely paying lip service to fighting against violence. As the more one fights the worse it becomes but rather if one reaches out with solutions one is able to address the underlying cause crime and violence. Together we can do more to combat crime. Ultimately karate is a magnificent vehicle to achieve discipline, confidence, good health, lift self esteem, and attain self defence skills. Since the inception of this campaign SKISA has held successful campaigns in areas such as Umhlanga, Phoenix, Sweet Waters (Pietermaritzburg), Ilembe District and various schools within KwaZulu-Natal (KZN). The 2010 campaign which was held on Women’s Day, hosted by Pick n Pay-Hyper, Durban North and was well attended by over 500 school children. School children were requested to showcase their talents by dramatising abuse in a play or sketch. The winners of the best sketch/play received Pick n Pay vouchers and hampers. All attendees received T-shirts to carry the message “THE ABUSE MUST STOP NOW” forward. The programme Director was famous personality Ms Shabnam Palesa Mohammed and was also attended by the Deputy Mayor Logie Naidoo.